Let’s face facts. No one actually looks for ads. No one. Most quality ads are a happy accident. “Delight and surprise” as they say. The only reason ads are still used is their low cost but with a whopping 1.21% CTR on mobile display ads, you have to wonder if it isn’t people in the advertising business clicking through, just to see how someone else’s ad looks. The issue with mobile is that the device is personal. It’s an extension of you. It is privy to our most personal conversations (phone or text) and for many is never more than 3 feet away from us at any time. Based on that, would you want an ad “on you”? I’m pretty sure I don’t. And if I were to, it better be so targeted. So contextual. So in the moment, that I feel like my friend was standing next to me and owned the business AND had an offer they knew I would love. This is the reason search based advertising for mobile devices owns 75% of the market and will continue to do so. It’s contextual and on-demand, which addresses most of the issues listed above. It’s also not disruptive, which many ads feel like. So based on all of this, mobile advertising can hurt your brand if your brand was responsible for the interruption your potential customer experienced while on their most personal of devices, trying to get something accomplished. Think carefully about what flavor of mobiel advertising you are participate in. (It’s okay to do display ads on PCs. No one sees them anyway.) 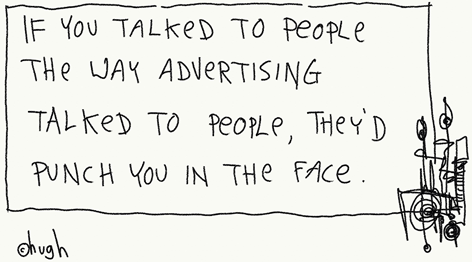 I leave you with a great quote I recently saw about advertising.